The SoundPoint IP 330 phone (2200-12330-025, 2201-12330-001), with its dual-port 10/100 Ethernet switch for LAN and PC connection, presents a cost-effective solution for cubicle workers as well as call center operators who use a “hard” phone in conjunction with a “soft” client running on the PC. The SoundPoint IP 330 and 320 phones feature a full-duplex IEEE 1329 Type 1-compliant speakerphone with Polycom's legendary Acoustic Clarity Technology that delivers excellent sound quality and enables noise-free and echo-free conversations that are as natural as being there. 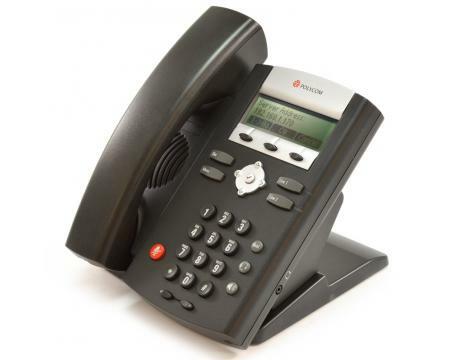 The SoundPoint IP 330 and 320 phones deliver through an intuitive user interface a full feature set encompassing both traditional business telephony features such as call hold, park, pick-up, transfer, and three-way local conferencing, and more advanced capabilities such as shared call/bridged line appearance, support of XHTML applications, and distinctive call treatment. The SoundPoint IP 330 and 320 phones are engineered to make installation, configuration, and upgrades as simple and efficient as possible. The phones’ standard base stand can be reversed to become a wall mount, eliminating the need for a separate accessory. Built-in IEEE 802.3af PoE circuitry and a dual-port Ethernet switch (SoundPoint IP 330 phone only) enable flexible deployment options and savings on cabling expenses. The SoundPoint IP 330 and 320 phones support remote, zero-touch provisioning and upgrade from a variety of servers, including FTP, TFTP, HTTP, or HTTPS. To ensure reliable, uninterrupted performance, the phones support boot and call server redundancy. The SoundPoint IP 330 and 320 phones have been tested and certified to deliver comprehensive interoperability and extensive feature support with leading SIP-based call control platforms by BroadSoft, Sylantro, Interactive Intelligence/Vonexus, Digium, and other Polycom Technology and Interoperability Partners2. The phones also interoperate with Microsoft® Live Communications Server (LCS) 2005 for telephony and presence. This broad interoperability offers Polycom customers a choice of supported standards-based call server solutions with which the phones can be deployed. All Polycom Soundpoint IP 330 phones all look and work the same. Release 1 and Release 2 phones are identical. All phones are PoE capabilty and we offer the power adapter as an optional item.